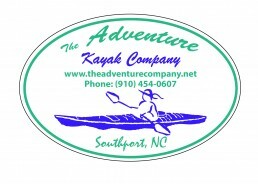 2018 Raffle Tickets are now available at the reception desk of the NC Maritime Museum- Southport! As new raffle prizes are obtained they will be added to this site! 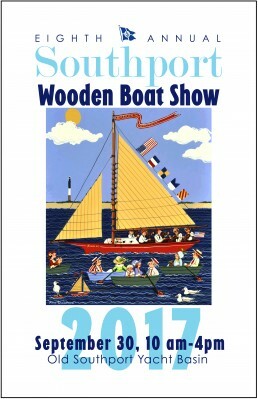 The raffle boat this year is a flat bottom, 10’ long, 3 ½’ beam, 3 ¼’ draft Anabelle skiff designed by William Atkin. The lines of Anabelle show a skiff with rather a bold sheer, rounding stem, and narrow stern. She will carry three comfortably and safely and four in a pinch. There is more than the usual amount of flare to the top sides, which spells stability in a skiff. 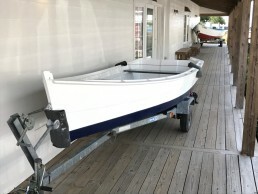 The bottom is without much rocker so as to make rowing easy, and to supply a fast craft if used with an outboard motor. 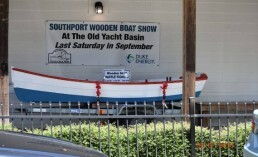 The Main Raffle Prize is a 14’ Clamming Skiff with cypress sides and marine plywood bottom, which was built during last year’s Boat Building Demonstration by the Cape Fear Community College wooden boat building program under the leadership of Mark Bayne. This was part of the SWBS’s Education Program which is sponsored by Duke Energy. Duke employees Frank Clark Jr, Kevin Hamm, Will Richardson, Doug Dillman, and Chris Garver volunteered to finish off the skiff to its “Bristol Finish” as pictured above. This included all marine grade sealants and paint, bottom paint below the waterline, and non-skid epoxy paint for the interior deck. The trailer is not included in the prize. 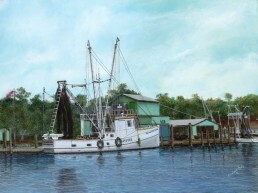 A beautiful 18” x 24″ signed and numbered framed copy of the White Pearl by Belvin R. Evans. The original copy of this magnificent painting was juried into the Northern Exhibition with the American Society of Marine Art in 2016. Framed by the Ricky Evans Gallery in a wooden frame with a ‘Sedona Driftwood’ finish. It looks amazing.